Citation: Allam NR. The Bureaucratic Broadcasting Governing Structure and Content Diversity: The Case of the Egyptian National Television System. Global Media Journal 2018, 16:30. Copyright: © 2018 Allam NR. This is an open-access article distributed under the terms of the Creative Commons Attribution License, which permits unrestricted use, distribution, and reproduction in any medium, provided the original author and source are credited. The television sector plays a crucial role in the formation of democratic societies and in the shaping and the transmission of social values as well. It can be similar to a cultural industry where there should be a well-defined policy that enables the market broadcaster operators to implement a management strategy (European audio-visual observatory-yearbook 2003). On December 26, 2016, the Egyptian President ratified a new media law, creating three new bodies that would regulate Egyptian print, broadcast and electronic media. The new law, which was approved by parliament, introduces three main articles in the Egyptian Constitution: 211 (The establishment of the Supreme Council for Media Regulation), 212 (The National Council for Print Media), 213 (The National Council for Broadcast Media). Following the January 25 and June 30 revolutions, there had been public demand for safeguarding the independence of the media by curbing direct and indirect government interference, and establishing a regulatory system for media outlets that would represent diversified opinions and ideologies. Among the factors that would act as an obstacle for the regulatory systems to implement its policies efficiently is the centralized bureaucratic structure of the Egyptian Radio and Television Union (ERTU) the governing body of the national broadcast media all over Egypt. The Egyptian television system that is coming under pressure from the international and global trend to regulate the broadcast industry lacks political independence which affects degree of diversity. Therefore, it is important to analyze its organizational factors that would enable the Egyptian media to reform and maintain an independent television system for its importance in maintaining an independent television sector with diversified content. Setting the derived principles from the literature review regarding the main organizational factors that would enable the independency of the national television system, and proposes a model for the Egyptian TV sector in terms of relative importance was essential to implement in the current case. From previous conducted research, countries in transitional stage are concerned mainly about economic, organizational, and legal frameworks that affect directly the degree of diversification. It is important at the beginning to refer to Fred S. Siebert, Theodore Peterson, and Wilbur Schramm who said that the heart of any media system is the relationship between media and government. Egypt is in a transition stage moving from the authoritarian system, where the press was heavily controlled by the government and it had to support all the governmental policies, to the libertarian system, where the free of speech and freedom of expression are the main features. Such liberal system in the press must bring along a change not only in the regulatory broadcasting system but also in the organizational structure of the broadcasting bodies . In his discussion of the “perverted” public theory, Horowitz  examines and explains the behavior of the regulatory bodies. He advocates that the public interest has been betrayed and deceived by the governmental regulations on the structure of the broadcast media that does not witness/reflect any advancement. Horowitz  identifies three main types of influence: instrumental, structural and capture of the media regulator (in this context it’s there is not independent regulatory body established yet, but it is the government that controls that public media and sets the policies and regulations). The instrumental influence takes place when staff within a regulator comes from the same background as those working in the industries they are regulating, and although they have related expertise, may invariably be sympathetic to the industry more than to the consumer side. Structural influence is focusing on the institutions of the regulator and the lack or the insufficient resources that the regulator possesses relative to the industry. In this context, it means that when the structure of the regulatory bodies lacks the enough resources, such as a well-defined strategy and a well examined rules and regulation, it will perform very poor to the media market. The capture Influence’s main characteristics are that the regulatory personnel are characterized by being institutionalized, which means that they are unwilling to change the status quo, and they do want to expand and to increase the regulatory activities. In this context, it means that if a regulatory body sticks to bureaucracy where the entire performance is standardized they will not be able to compete with new evolving media trends. The broadcast media in the Arab countries and the authoritarian system that it performs within the government dominates and controls the broadcast media in the Arab world because of high cost of having a radio or television station that exceed the capabilities of private individuals and thus encouraging a status of government monopoly over the broadcasting system. Although all the Arab broadcast systems are governmentally controlled, there are two main categories where all the Arab country media are divided between them. The first category is the "strict control systems" where the media are used as the mouthpiece of the government and they have certain political targets; the second category, although the media are not heavily politicized and provide more entertaining and general programs, yet it is still controlled by the government . Countries that fall under the strict control system are: Algeria, Egypt, Iraq, Syria, Libya, South Yemen and Sudan. Television emerged in these countries quicker than the other countries because the governments were willing to have more impact on the citizens through anther medium: television. The first Arab television station was launched in Iraq in 1956 where the content was quite politicized favoring the communist regime. Egypt and Syria began their television broadcasting stations in 1960. Egypt was able to spread widely by placing several transmitters to enable the widespread of the service . Algeria and South Yemen also introduced the television broadcasting system and they were using it mainly for their political use . The kind of programming in these seven countries will be a result of the heavy control policy used by the government over the media. For example, the Sudanese television always sets the agenda of the newscasts to the government achievements. Programs in Iraq and South Yemen were also much politicized promoting the government’s acts. Palestinian programs were always monitored by the host government and they cannot cross the red line. The best programs that were offered at that time were found in the Egyptian television programs, where President Abdel Nasser used the medium to mobilize the citizens by promoting the social and political change required to get off the colonial regimes . The second category which includes the rest of the Arab countries, except Lebanon is called the "Loyalist Broadcasting". This category includes Morocco, Tunisia, Jordan, Kuwait, Saudi Arabia, Bahrain, Qatar and the United Arab Emirates. The broadcasting system in these countries remain under the government control because these countries are aware of the impact of the broadcasting systems on the masses of people, yet their content was not politicized and they tend more towards entertaining and general programs . It is worth mentioning that although Egypt and Tunisia have witnessed changes after the revolutions that both countries have witnessed in 2011. The number of private satellite stations increased and a number of regulatory approaches were taken, yet many deficiencies still exist in the organizational structure that has to be adapted to ease the implementation of the regulator’s policies. The structure of government controlled media has not changed a lot since its introduction; governments still own the broadcast media; the only difference is that private television did not exist except some illegal station in Lebanon, yet nowadays Morocco, Lebanon, Palestine, Egypt and Qatar have their private broadcasting stations. The monopoly over the broadcast media was over in Lebanon during the devastated civil war between Muslims and Christians. This war was the main cause of private television expansion as many businessmen men applied for broadcast license. Each of these private stations was owned by religious or political party. LBC was owned by Maronite Christians, Future TV was operated by Sunni Muslims, MTV was owned by the Orthodox Christians, and NBN was operated by Shia Muslims. Qatar created a new General Association for Radio and television to monitor the terrestrial broadcasting facilities which are still owned by the government. The Qatari government still owns all radio and television broadcasting station except Al-Jazeera. The United Arab Emirates owned the radio and television stations, yet it established the Emirates Broadcasting Corporation to enable the terrestrial channel to compete with the satellite ones. Dubai, Sharjah and Ajman emirates were controlled by the UAE federal government, yet in reality they were controlled by the emirate governments. In Egypt the censorship remain tight especially with anything relating to the national security or the government. Although the Egyptian Radio and Television Union were established to have authority upon the Egyptian broadcasting system, this ERTU is controlled by the government in terms of management, funding and structure . The terrestrial Egyptian television system operates under complete government supervision, leaving the private stations with only the Satellite platform from which to operate. Licenses are issued and frequencies are assigned through the General Authority for Investment (GAFI) which is affiliated to the Ministry of Investment, and therefore is still part of the government. The satellite channels usually enjoy more freedom than the terrestrial channels to criticize government decisions or policies. Ironically, these satellite channels, which are not monitored or governed by any charters or regulations, are the most favored platform by viewers . Jordan also decided to set up private broadcasting stations by Jordanian foreign companies beside the public channels, but with condition that the private television stations will go in accordance with the Jordanian state values and policies. Saudi Arabia television did not change and no private channels were introduced; yet minor change in the format of the programs were introduced, such as having some political programs hosting an official and the viewer call in by phone to ask him questions. Iraq remained controlled by the government as it jammed foreign broadcasts until the occupation authorities allow private radio and television stations to operate. Libya and Algeria were lagging behind as they are still owned and controlled by the government and fall under the authority of the Minister of Information. Sudan also remains the mouthpiece of the government as it directly interferes in the choice of content that favor the government policy. Iraq nowadays has diminished its state broadcasting system converting the state run channels into a pure public service broadcaster . The Egyptian Radio and Television Union (ERTU), which oversees and monitors the government controlled media outlets (radio and television), used to work in affiliation with the Ministry of Information under Law 13 of 1979, last modified by Law 223 of 1989 . This law is now cancelled after the approval of the President of the Egyptian Republic to Law 92 for 2016. In 1960, Television started in Egypt, with a system that include three channels and was considered one of the most extensive and effective television systems among all the underdeveloped countries of Asia and Africa and particularly the Arab world. The first thing to be broadcast in the Egyptian Television was verses from the Holy Koran followed by a speech from Nasser. It was quite clear through the usage of Nasser to the medium and through the agenda of the news presented, that the medium was going to be used as a propaganda tool for the government . The Egyptian radio broadcasting system is an absolute monopoly, operating under direct government supervision with a centralized model of broadcasting for radio and television, and with only three semi-private radio stations in the market on the FM spectrum (Nejoum 100.6 FM, Nile 104.2 FM, and Radio 9090 FM). The terrestrial Egyptian television system operates under complete government supervision, leaving the private stations with only the Satellite platform from which to operate. Licenses are issued and frequencies are assigned through the General Authority for Investment (GAFI) which is affiliated to the Ministry of Investment, and therefore is still part of the government. The satellite channels usually enjoy more freedom than the terrestrial channels to criticize government decisions or policies. Ironically, these satellite channels, which are not monitored or governed by any charters or regulations, are the most favored platform by viewers . Under the new law, the public and private media will be supervised by the Supreme Council for Media Regulation, thus allowing the state-owned media to be converted into a real public service broadcasting system, and enabling the private media to flourish within policies that guarantee fair competition. State ownership in most of the countries acts as a barrier towards the existence of an independent governance structure that would ensure the independence of the public broadcasters and content diversification . Also, having an independent broadcasting regulatory body without clear laws controlling the management procedures disables the creation of an independent television system. For instance, in Poland, although in 1992 the Broadcasting Act legislation issued a law stating the establishment of the National Broadcasting Council as the regulatory authority, and although it acted outside the government structure, it did not perform independently because there were no clear laws preserving its independency from the Polish presidents and governments. For example, in 1994, President Walesa fired the chairman and two members of the council because they issued a license to a commercial broadcaster who has opposing views with the President . In Uzbekistan as well, a decree was issued stating media independency from state budget and the importance of establishing a company with independent governing members. However, there were no clear rules regarding the management of this independent body. Moreover, members were benefiting from the rights they have which make them pro-government to main the privileges they have, and accordingly the broadcast sector remains under the government authoritarian control where no can criticize the government and any topics related to politics have to be addressed only by journalists working in governmental bodies . Organizational independence is mainly measured by the managerial line, which is composed of specialization, degree of formalization, degree of decentralization, size of organization, the appointments of members, and the duration time. These components define the organizational structure . The kind of strategy defines the structure of the organization in terms of the components mentioned above. Other factors affect the structural design: technology and environmental factors (Figure 1). 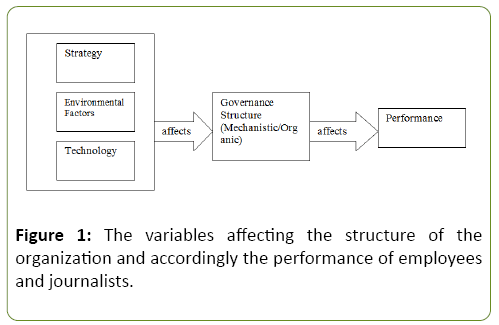 Figure 1: The variables affecting the structure of the organization and accordingly the performance of employees and journalists. The ERTU is composed of 12 sectors, and each sector has several subdivisions of departments, which leads to a high degree of bureaucracy and centralization. The television sector is composed of the following sectors and divisions represented in the diagram below: in the following diagram, C.D. stands for Central Division and G.D. stands for General Division (Figure 2). Figure 2: The organizational structure of the ERTU. The governance structure of the ERTU can be classified as a typical bureaucracy structure. The tasks performed within the organization are achieved through a high degree of specialization under very formalized and strict rules. High degree of formalization disables employees to get engaged in alternative behaviors or even think of alternatives. Although a primary strength of bureaucracy is to perform the standardized activities in a highly efficient and professional manner , yet the outcome of the activities performed at the ERTU is of a very poor quality and does not offer any potentials compared to the competitive surrounded environment. Departmentalization also is divided upon functions where the goals of the organization sometimes override . This goes to the reason that bureaucracy's institution has less talented, less costly managers who range between the lower and the middle classes. The decision making process in the ERTU is very centralized falls completely in the hands of the ERTU head who is appointed by the president. The structure is also quite tall includes a several levels of management. There is high functional division of labor because in such tall structure, the work is highly specialized and everyone is concerned with his specialization area. The chain of command is top down where the decision must be taken from the managers and employees do not have room for taking decisions defines the high levels of standardization. The decision is centralized in the hands of the ERTU chair, which disables the body to easily adapt new policies. Appointment procedures are centralized as well. The ERTU operates under the Minister of Information, and the head is chosen by the President of the Egyptian Republic., then the Ministry of information choose most of the members and a small number is appointed by the Council of Ministers who appoints members from different sector to maintain diversity, such as lawyers, artists, judges, etc….yet, although these members are chosen to ensure internal pluralism, most of them are chosen on the bases to be supporting to the ruling regime in order to apply the political agenda of the regime . All of the members of the board of trustees are appointed by the president of the republic and the prime ministry, and they are chosen on the bases of favoritism in order to follow the governmental agenda; so the broadcast media in Egypt is considered official talking about the president's activities and giving it the first priority on the agenda ignoring other important topics . This mechanistic structure is the result of the cost minimization strategy where there are no plans for innovation to provide distinctive programs to compete with the surrounding environment. Environmental variables as well discourage any changes. This is because the market is not competitive due to the government monopolization over the whole sector disallowing other rivals to enter the market and compete; and this encourages the cost minimization strategy . Moreover, the government has hands also over changing any laws in the constitution; this power gives the government the right to keep the volatility of laws quite static which makes the market static with no incentive to innovate and accordingly the market is characterized by being homogenous and the level of concentration is high falling in the hands of the government. As for the capacity, the non-transparent advertising rules makes the ERTU has the largest share of advertisements in its national channels, which leads to have abundant financial resources, beside the government subsidy. The management of the broadcasting sector was rated as unsustainable, which means that the government is doing the minimal to enable a free and independent media system . Bureaucracy is still alive because of its ability to manage large scale of activities. Organizations maintain bureaucratic structure because at times of environmental uncertainties, the impact of these uncertainties is reduced by following management strategies, such as strategic alliances and environment scanning . Although the goals of bureaucratic structured organization can be achieved by hiring people after going through intensive education training programs, yet training at the ERTU has no internal training programs, which is integral for staff development . According to the World Bank, the poor management which is characterized by unfair legal system leads to the existence of bureaucracies that are neither accountable nor reliable (World Bank, 1994). Some countries are trying to maintain diversity in the governing member in order to avoid any political interference. The strategy of France, Germany and the UK are similar aiming for providing innovative products to sustain within the surrounding competitive market. The structure is organic following the innovative strategy whose target is to introduce new and creative products (programs). Size is not quite large, with exception to Germany, which is characterized by its large number, yet manageable; this moderate size allows flexibility and involvement in different works leading to high performance and satisfaction. Environmental variables are regulated. The capacity that is represented in the financial resources is regulated by percentages in the public sectors. Laws are derived from several sources ensuring its adaptability to the changing environment. The market is heterogeneous because of the high degree of competition between different system, yet regulated by ownership and cross ownership in the private sector . These countries are applying organizational independence from two perspectives; first is through the organizational structure of the public broadcaster corporations and second is through an independent authority which monitors the performance of public and private broadcasters and whose governance structure affect independence. The coming part is showing the structure of the public broadcasters’ entities and the independent regulatory authorities with analyses to their structures and their impact on performance. For example, the governance structure of the public television broadcaster in France, France Television, is managed by an administrative board, which is composed of 14 members and the term duration is five years (Table 1). Table 1: Shows the governance structure of the French public broadcaster organization. Two members of parliament One appointed by a National Assembly and one by senate. Although, the structure of the public service television in France seems to be organic and having a flat shape, yet the actual role depends on the chair’s willingness. Although there is a claim of decentralization, yet this is not happening in practice. Also, the ombudsmen have no power or sanctions to impose if violation of rules happens (Figure 3) . 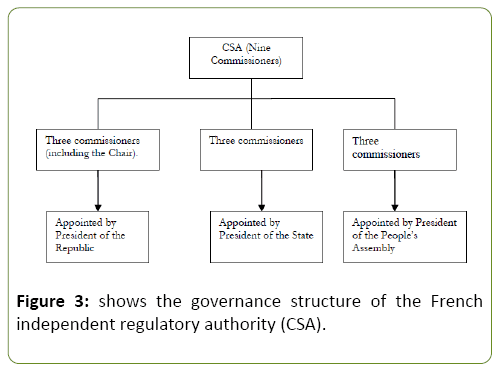 Figure 3: Shows the governance structure of the French independent regulatory authority (CSA). The CSA is considered to be an independent regulatory administrative authority. The CSA is led by nine commissioners, where three of them are appointed by the President of the Republic, three by the President of the Senate and the other three by the President of the National Assembly. To ensure that there is no political pressure exerted on the hiring of any of the commissioners, any commissioner cannot be dismissed from his office and he/she cannot be re-elected more than one term (Six years). It is composed of different eight departments that have four main missions: first is licensing the private radio and television stations, appointing the heads of the public radio and television stations, monitoring if the radio and television broadcasters comply with programming requirements, and finally expressing their opinions about any newly issued broadcast law . The work specialization is not quite high and the formalization of work as well. The degree of centralization is not high because the decision is not in the hand of one person, yet the nine commissioners are responsible for. The size of the regulatory body is moderate. Criticism goes to the hiring procedures as they are done through the president of the Republic and President of the State and he President of the People’s assembly, Unlike Germany where representative of social groups have a say in the Board of Trustees . After the examination of the different frameworks that affect the establishment of an independent television system, a set of principles for the use of regulation, and policy for television broadcasting system reform were identified. These identified principles were derived mainly from research reports and other available literature. They can serve as guides or helpful advice for countries whose systems are moving from the authoritarian to the libertarian identifying the main pillars that affect the existence of an independent television system. Yet, before these principles are utilized, they were measured in terms of importance by media experts to serve as a base in identifying the priorities when building a model for the Egyptian television system. These principles were derived from the literature of different researches and reports, and from the models of the three chosen countries which moved from an authoritarian system into developed ones. The proposed model advocates the adoption of an organizational structure that goes coherently with the changing legal framework and encourages diversified varied content for the public. The model is divided into two main categories: structure and appointment procedures. There should be a flat structure in the governance of the Egyptian Broadcasters: A flat structure comes along with a decentralized system. A flatter structure is viewed as one of the basic factors that encourage flexible commination, especially in Egypt when the current environment is experiencing change, a flatter structure will simplify the communication process and cope with the technological changing environment through more decentralization in the decision making. There should be decentralization in the decision-making process: All of the Egyptian national networks and local Egyptian channels are centralized where the decision making falls in the hand of the chair person, and with the tall structure and bureaucratic organization, the decision making process is quite slow, which does not match with the new technological environment that requires fast pace in the decision making process. Flexibility will enable the adaptation of new policies instead of being centralized in the hand of the ERTU chair, and accordingly change in the chain of command to be wider. In addition, centralization negatively affects programming provided to rural areas as it does not stem from the rural communities, and therefore, it does not match the rural areas’ interests or needs. There should be application of technology within the governance structure of the Egyptian broadcasters: Technology is highly rated by most experts as the latest ideological trend in management is the usage of hi-tech in order to cope with the changing environment otherwise, this will lead to the disadvantaged of the system. Also, a decentralized, flatter structure requires an application of non-routineness and non- standardized technological application. In an era of media convergence, that requires delegated decision authority, and an adaptable structure, and the provision of new services and activities, a non-routineness and non-standardized technology application is essential. Therefore, the new PSB networks governance structure need to be flatter in order to have more flexibility in the decision making process and apply any changes rapidly to best serve the public. Board of Trustees must be chosen from different backgrounds: Different backgrounds are essential in ensuring diversity of ideas that would be provided to the audience and enriches a diversified content. The appointment procedures should be changed to ensure internal pluralism within the ERTU Board of Trustees. The current regulations put the government in power as the ERTU operates under its chairperson (after the abolishment of the Minister of Information) and the chairperson is chosen by the President of the Egyptian Republic., the chairperson then chooses most of the members and a small number is appointed by the Council of Ministers who appoints members from different sector to maintain diversity, such as lawyers, artists, judges, etc… yet, although these members are chosen to ensure internal pluralism, most of them are chosen on the bases of supporting the ruling regime in order to apply the political agenda of the regime. All of the members of the board of trustees are appointed by the president of the republic and the prime minister in order to conform to the governmental agenda. Ensuring internal diversification and pluralism of Board of Trustees ensures a diversified program output reflecting the interests of major and minority groups. Nomination of candidates to the board should come from civil society and professional organizations: Nominations from different backgrounds guarantee the aspect of independence. This correlates with the selection of the Board of Trustees who should come from different background and chosen by different organizations to ensure that there is no political pressure practiced on the Board of directors in setting the content agenda. Officials are welcomed to nominate as well, yet they should neither have the upper hand in choosing the members, nor to be the only ones to nominate. Board of Trustees should be responsible for appointing the General Director: In Egypt, being chosen by the Board of Trustees who will be nominated by different entities and from different backgrounds will ensure transparency in choosing a Managing Director without intending to serve the governmental agenda. Board of Directors should function without any political interference: Board of Directors should enjoy high degree of freedom to make sure that government is not influencing the public and serve its own agenda by enforcing certain agendas on the BOD. Being independent from such interference will allow the existence of service that mainly serves the public. Independence from political interference is practiced in the processes of hiring, planning and management. Moreover, the number of Board of Trustees should be distributed equally and there should be a fair representation between the number of members from the parliament, the government and the number of members from civil societies and NGOs not to enforce a governmental agenda. With the newly approved law, a new appointment system is to be implemented. The situation prior to the new law was very complicated as the Ministry of information used to choose most of the members and a small number was appointed by the Council of Ministers who appoints members from different sector to maintain diversity, such as lawyers, artists, judges. Moreover, most of the members of the board of trustees were appointed by the president of the republic and the prime ministry, and they were chosen on the bases of favoritism in order to follow the governmental agenda; therefore, there was a lack of balanced and diversified output due to the lack of internal pluralism. Board of Trustees should not be part of, receiving payments or holding interests in media organizations or media related sectors: Most of the experts agreed on this principle ensuring its importance to ensure ethical behavior avoiding any conflict of interest between personal benefits and duties. As Egypt in transitional stage, clear rules on conflict of interest are required to enable the media environment towards independence and integrity. Board of Trustees should be responsible for monitoring broadcasters’ compliance with content guidelines: Board of Trustees should ensure that TV programs include the different content required, yet the newly established regulatory body is the one responsible to monitor and send warning and take actions against any violations. Board of Trustees should not be engaged in any political or religious party: They should be experts in the field of consultancy with no engagement in any political activity or being activists in order not to influence the decision of the board. Policies and regulations have become essential in today’s broadcast sector for the inclusion of new technological advancements that lead to the provision of different types of content with no restrictions carrying the potential of unlimited content of audio and visual materials. Egypt is a transitional country where the system is moving out from the authoritarian towards a social responsibility system. Yet, maintaining control over the national broadcasting system had led to the absence of political diversity and the fragmentation of audience. The derived model focused on having a managerial line, which is composed of low degree of specialization, low degree of formalized rules, high degree of decentralization, size of organization, the appointments of members, and the duration time. As for the strategy, the ERTU should adapt is the innovative strategy. This is due to the fact that the organic structure leads to the application of the innovative strategy whose target is to introduce diversified creative products (programs). In a nutshell, the proposed organizational model supports the conversion of the ERTU structure from a tall bureaucratic structure into a flat one where there is high delegation for employees through the decentralization of the decisionmaking process. The model ensures the importance of transparency in the appointment procedures to avoid political interference, and promote content diversification. Rugh W (2004) Arab Mass Media. Newspapers, Radio, and Television in Arab Politics. Praeger Publishers, Westport, Connecticut London. Horowitz RB (1989) The irony of regulation reform: The deregulation of American telecommunications. New York: Oxford University Press. Napoli A (1995) Assessment of Egyptian Print and Electronic Media. Submitted to the United States Agency for International Development. Amin HY (1998) American Programs on Egyptian Television: Prospects and Concerns. In: Kamalipour YR (ed.) Images of the U.S. Around the World: A Multicultural Perspective, State University of New York Press, pp: 319-334. Egyptian Radio and Television Union (ERTU) (2014). Printout, Ministry of Information, Cairo. Amin HY (2016) The Formation of the Higher Media Council and Media Scenery Restructure. Al Watan: 14 June 2016. Newspaper. Article 19 (2006) A Media Policy for Iraq. Global Campaign for Free Expression: UNESCO. Egyptian Radio and Television Union (ERTU) (2009). Printout, Ministry of Information, Cairo. Television across Europe: Regulation, Policy and Independence. Open Society Institute (OSI). EU Monitoring and Advocacy Program, Network Media Program. Monitoring Reports, 2005. Price M, Raboy M (2001) Public Service Broadcasting in Transition: A Documentary Reader. Occasional Paper Series. Bureau for Democracy, Conflict and Humanitarian Assistance. U.S. Agency for International Development. Robbins S (2003) Organizational Behavior (10thedn), San Diego State University. Pearson Education International. Media Sustainability Index (MSI) (2006) Middle East and North Africa. IREX. Boyd D (1993) Broadcasting in the Arab World, A Survey of Electronic Media In the Middle East, Second Edition. Iowa State University Press. Ames, Iowa. Development of Sustainable Independent Media in Europe and Eurasia, Media Sustainability Index (MSI), 2004. USAID, IREX.